At first the administration had no reservations about handing over to the Russians even unwilling Soviet citizens. In June 1945, for example, the Combined Chiefs of Staff authorized SACMED Field Marshal Alexander to transfer to the Soviet authorities approximately 50,000 Cossacks who had been serving with the German armed forces at the time of their capture. But the pressure on Washington had a cumulative effect, especially as public opposition to forced repatriation increased and there were no American soldiers in territories under Soviet control. Finally, on 21 December 1945, the commanding general of U.S. forces in the European Theater and the commander in chief of U.S. forces of occupation in Austria were instructed not to compel the involuntary repatriation of persons who had been citizens of and actually had resided within the Soviet Union on 1 September 1939 but who did not fall into any of the following classes: those captured in German uniform; those who had been members of the Soviet armed forces on or after 22 June 1941 and who had not subsequently been discharged; and those who had been charged by the Soviet Union with having voluntarily rendered aid and comfort to the enemy. By the time these instructions were given, more than 2 million Soviet citizens had already been repatriated from western Germany. This left only approximately 20,000 Soviet citizens in the U.S. zone in Germany. Moscow had attained its goal, but so had Washington: it achieved the quick repatriation of U.S. pows liberated by the Red Army all together approximately one-third of all U.S. pows and at the same time succeeded in ridding itself of the responsibility for millions of unwanted Soviet citizens in western parts of Germany. The dispute between the British and the Soviets became public when, on 30 April 1945, Pravda published an interview with Colonel General Filip Golikov, head of the Soviet Repatriation Committee.�Golikov compared a figure of more than 1.5 million Soviet citizens repatriated from areas overrun by the Red Army with the lowly figure of 35,000 Soviets repatriated out of a total of more than 150,000 liberated by the Allies. Thousands of Soviet citizens, he claimed, were forced to wait many months for transport to their native land. Not everywhere, he charged, were former Soviet pows being treated as citizens of an Allied power. The Russian repatriation official then gave several examples of breaches of the Yalta agreement by the Allies: failure to report the presence of more than 1,700 Soviet citizens in three American-run camps in Britain; failure to hand over 300 Soviet citizens whose existence in Britain was known; efforts to deter Soviet citizens in Egypt from returning to the Soviet Union; failure to properly segregate Soviet pows from Germans in Camp 307 in Egypt; and failure to expedite the return to the Soviet Union of 1,156 Soviet officers and men. Sick Russians, furthermore, were being sent to German camp hospitals. Local censorship, he asserted, had prevented the Soviet repatriation administration from discovering these infamies until much later. While the Foreign Office preferred to avoid public recriminations with Golikov for fear that this would poison the atmosphere further and impede finding solutions to thorny pow questions, Whitehall recognized that they could not entirely ignore Soviet propaganda, especially as Golikov’s statements had given rise to a number of parliamentary questions. On 2 May, for example, mp Thomas Henry Hewlett asked the foreign secretary ‘‘whether, in view of the excellent treatment given by the Russians to British prisoners of war whom they liberate, he can state whether special effort is made to extend similar treatment to Russian prisoners of war liberated by the British.’’ Undersecretary of State Richard Law dispelled ‘‘misleading statements’’ that had appeared in the press about British officials’ treatment of Soviet citizens liberated by British forces. Law told the House that many of the large numbers of Soviet citizens who had been liberated by the advancing Anglo-American armies since D-Day had been, or were at the time of their liberation, serving in the Todt and other German official criminal organizations; furthermore, a considerable number of them had fallen into Allied hands while still in German uniform. Law’s tactic was first to categorize the Soviet citizens as German collaborators and then to state that the vast majority of Soviet pows had been forced to serve the Germans against their will. Members of Parliament were further told that 42,421 Soviet citizens had been repatriated from the United Kingdom and the Mediterranean area since October 1944; to this figure ought to be added the 14,565 liberated by U.S. forces. With the exception of one ship provided by the Americans, all the shipping and other transport for these 56,986 Soviet citizens had been provided by London, which meant there were less funds for other vital purposes. Pointing a finger at the Soviets, Law contended that the remaining Soviet citizens in western Europe could have been repatriated much earlier if the Soviet government had also provided shipping. For their part, the Soviet authorities had notified Britain of 3,854 British subjects liberated by their forces up to 21 April 1945; of these, 3,639 had passed through the camp in Odessa, which was the most advanced point to which the Soviet authorities had allowed British officers to have regular access. In this case, too, British shipping alone had been employed to bring these men home. Law concluded by giving a hint of Whitehall’s dissatisfaction with the Soviets’ decision to go public with their criticism. In the conquest of Livonia, Bishop Albert took an important decision when he moved the centre of all his operations to Riga, close to the mouth of the Dvina, which was strongly fortified. Castles were the keys to the land, and time and time again resisted pagan assault. In 1211, a large Estonian army supported by a fleet attacked Caupo’s great fort on the Aa, which was partly held by Christian Livonians; they were able to hold out until a relief force from Riga arrived.29 But not only were the forts of the Christians stronger – they had also developed the art of siege warfare much more highly. The decisive technical factor which sustained the German conquest was not military at all, but a by-product of the economic expansion of Europe, the merchant cog or round-ship. These were large, solidly built craft up to 30m long and 9.5m wide – by the end of the thirteenth century, deadweights of 200 tons were possible. 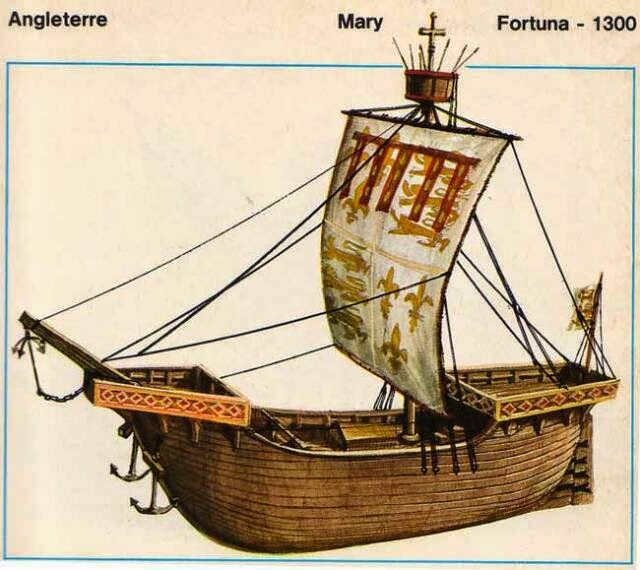 They were popular with merchants in the Baltic and elsewhere because they could carry an immense load, up to about 250 tons, with a crew of only about 18–20, and so they were available to the German crusaders. By contrast, their pagan enemies did not have the means to build such expensive vessels. The cog could carry 500 people – very useful for bringing in and supplying crusaders and their settlements. As fighting ships, they were helped by a high freeboard, which meant that they towered over anything else that could float, like a castle at sea: indeed, one was turned into a floating fort to guard the mouth of the Dvina against enemy attack. The cog was never fast or manoeuvrable, but it was very seaworthy, especially after the introduction of the stern-post rudder, and it could be towed up rivers. 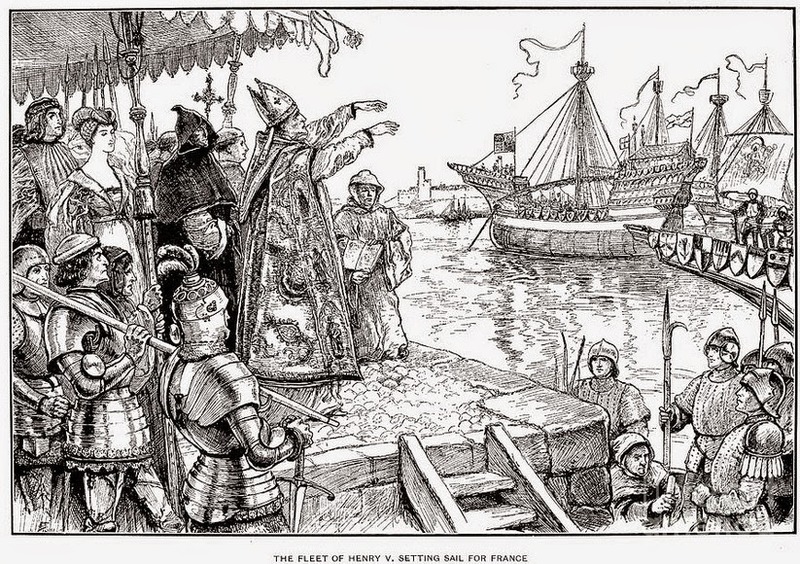 Henry the Lion came to recognize the need for seapower, as we have noted, but the increase in Baltic shipping brought a decisive advantage to the Germans. In 1215, two cogs were enough to scatter the Estonian fleet in the mouth of the Dvina, and a little later that year nine cogs bearing pilgrims returning to Germany were trapped by bad weather in Oesel, where large numbers of Estonian ships tried in vain to destroy them. The determining factor in Anglo-Welsh relations was the will of the Crown. The creation of a March was a useful expedient for the Norman kings, but their will always underpinned it. The tide of conquest ebbed and flowed with “strong” and “weak” English kings. When Henry II decided to come to terms in 1172 he ushered in a long period of relative stability, while the fate of the Braose under John shows how aware the English kings were of the risks of a formidable military power emerging amongst the Marchers. When the royal will was turned against Wales, it was evident that the superior wealth of England provided larger and better-equipped armies with large cavalry forces, and it was only the land and weather that frustrated them. The Welsh reacted quickly to the Norman weapons of castle, cavalry and crossbow, and by 1094 had established means of dealing with them; furthermore, they had their own tradition of archery. What is striking is the extent to which English progress depended upon command of the sea, and Gerald of Wales clearly recognized its importance. Many of the key centres of Marcher power – notably Kidwelly, Carmarthen and Pembroke – were on or accessible to the sea. According to Welsh tradition, Robert FitzHamon began the conquest of Glamorgan by a landing from the sea at Portkerry in 1093. Hugh of Shrewsbury was killed by Magnus Barefoot of Norway and his fleet off Anglesey. In 1114, Henry I supported his invasion with ships, while the Welsh paid for a Danish fleet to support their attack on Cardigan castle in 1135. Henry II used fleets to attack Anglesey and North Wales in 1157 and 1165, while shipborne forces from Ireland helped Henry III in the war that led up to the Treaty of Woodstock of 1247. Edward I used a fleet to great effect in his conquest of Wales, and the great castles that he built to enforce his conquest are by the sea and often have ports. Scotland was another peripheral area, but here conditions were very different. The North of England required a brutal military subjugation, and Norman rule there long consisted of little more than a series of embattled outposts beyond the Humber. Here, it was hardly possible to establish predator landlords with a vested interest in conquest. Any such development was effectively forestalled, because the kings of Scotland recognized the utility of reorganizing their kingdom and they invited in Norman barons, who were often established landowners in England – to the great chagrin of many of the native chieftains. Scotland was not as inviting a prospect as Wales for the Norman predators. But the issue between the kings of the two lands was the March, for both laid claim to Cumbria and Northumberland. It was to settle this point that in 1072 William the Conqueror led a great raid up the east coast, supported by a fleet, and received the homage of Malcolm Canmore at Abernethy. But this was inconclusive, and in 1080 Robert Curthose led another Norman attack and received another submission, but founded Newcastle – a significant advance of the Norman frontier, which Rufus extended yet further by the establishment of a castle at Carlisle in 1092. Normanization then proceeded apace in Scotland, and Henry I married a Scottish princess, bringing peace between the two lands. Emperor Franz Joseph started to regather and rearm an army to be commanded by Anton Vogl, the Austrian lieutenant-field-marshal who had actively participated in the suppression of the national liberation movement in Galacia in 1848. But even at this stage Vogl was occupied trying to stop another revolutionary uprising in Galacia. 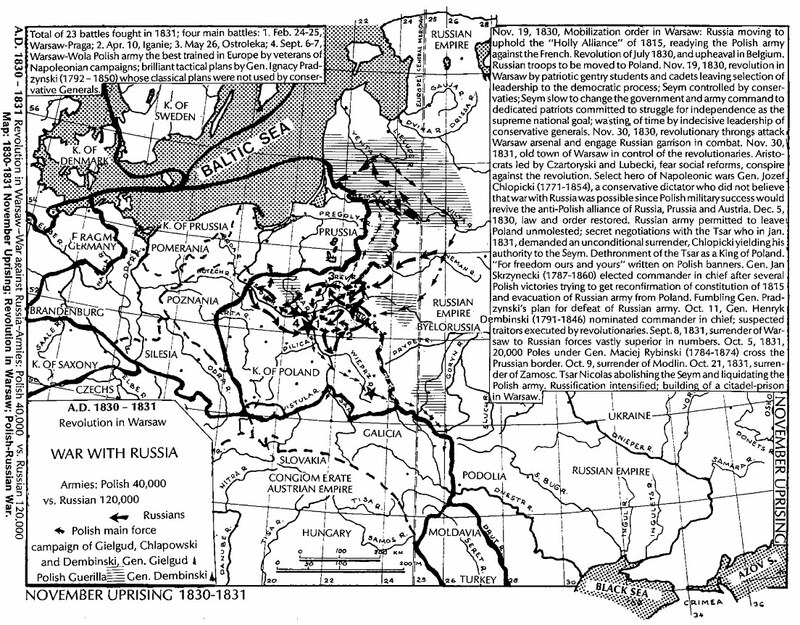 The Czar was also preparing to send 30,000 Russian soldiers back over the Eastern Carpathian Mountains from Poland. Austria held Galacia and moved into Hungary, independent of Vogl’s forces. On August 13, after several bitter defeats in a hopeless situation, Görgey signed a surrender at Világos (now Şiria, Romania) to the Russians, who handed the army over to the Austrians. In the early months of 1848 France was in a ferment over the country’s franchise. Louis-Philippe ‘ King of the French by the Grace of God and the Will of the People’, had attempted to establish a constitutional monarchy on the British pattern. But the solid basis of a sound tradition was lacking and malcontents at each end of the social scale were quick to criticize shortcomings while ignoring the good points: the 1830 barricades were, after all, still a vivid memory. On February 24, 1848, the industrial population of the Paris faubourgs stormed into the city, and the luckless Louis-Philippe was forced to flee to Great Britain. The spirit of revolt quickly spread to other countries, the vast and heterogeneous Austrian Empire being a predestined victim. Riots broke out in Vienna, and Metternich escaped on March 13 to commiserate with Louis Philippe in England. The Austro-Hungarian Army at this time still wore the white short-tailed jacket, but the headdress was now a cylindrical shake .Regimental distinctions continued to be shown by the color of the collar, cuffs and turnbacks combined with the white metal or brass of the buttons. One of the most interesting revolts. however, occurred on March I, 1848 at Neuchatel, That territory-which, incidentally, had produced de Meuron’s Regimen t for the Dutch and British services, as well as Berthier’s yellow-coated battalion for Napoleon – had been ceded to Prussia after the Napoleonic wars, and many of the ‘Canaries’ joined the newly formed Prussian Gardeschütze-Bataillon for service in Berlin. Fortunately for them, because they were then spared the agonizing duty of having to fire on their own countrymen when the latter marched down from the Jura Mountains to attack the castle at Neuchatel. The Prussians were soon overcome, the inevitable republic proclaimed, and Neuchatel became a Swiss canton. 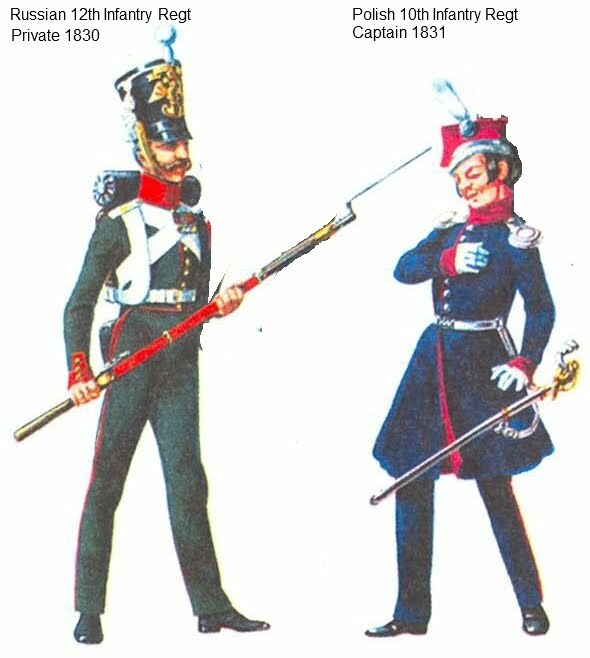 The Prussian troops had now taken the famous spiked helmet into wear- but in a much taller version than the familiar 1914 pattern. The tunic was beginning to replace the long-skirted coat, and long trousers were being worn in preference to breeches and gaiters. The most dramatic surge of resistance to the conservative order came in Poland, where in November 1830 the patience of the patriotic Polish nobility within the Russian partition snapped when the Tsar mobilised the Polish army in response to the revolutions in Western Europe. The insurrection lasted ten months and was crushed – after some bloody and intense fighting – by a 120,000- strong Russian army under General Ivan Paskevich (who would help repress another revolution in 1849). In the retribution that followed, a staggering eighty-thousand Poles were dragged off in chains to Siberia. Poland sat uneasily under Russian rule. The revolutions of 1830 provided inspiration for Polish revolutionaries, and a ticking clock. Poland would soon be occupied by massive numbers of Russian troops preparing for foreign intervention, meaning revolution had to come quickly or not at all. In November 1830, Polish cadets and junior officers launched a coup in Warsaw. They occupied public buildings, Warsaw crowds seized weapons from a government arsenal, and Russian authority evaporated. Nicholas’s brother Constantine, governor of Poland, escaped capture but begged Nicholas to show restraint. Constantine’s hopes for moderation were dashed. The Polish insurgents grew increasingly radical, formally deposing Nicholas as king of Poland at the beginning of 1831. Nicholas in turn resolved to crush this by force. As in the two preceding wars, Russia found it difficult to employ its potential strength effectively. Nicholas’s troops invaded Poland in February 1831, and the early clashes were inconclusive enough to give Poles some hope of success. The spring thaw of 1831 turned roads to mud and delayed Russian progress, along with supply problems, a cholera epidemic, and harassment by Polish partisans. Finally, at the end of May, the Poles suffered a major defeat at Ostroleka, and the cohesion of Polish resistance broke down. A Russian army reached Warsaw in September 1831, and resistance collapsed. Thousands of Poles went into exile in western Europe, boosting an already-burgeoning wave of Russophobia. Nicholas was restrained in his reimposition of order in Poland, though the separate Polish army was abolished and its troops integrated into Russian forces. 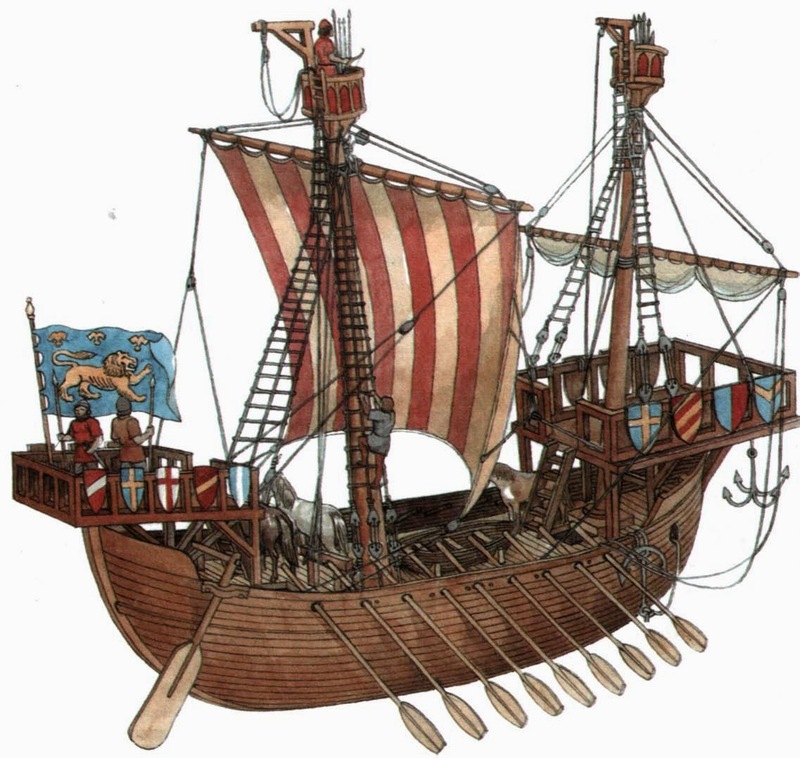 At the beginning of the fourteenth century, the English Cinque Port towns maintained a fleet of vessels such as this – clinker-built with forecastles and aftercastles for fighting purposes, and with a wide, clear deck. Vessels of this type were not limited only to coastal defence. Illustrated manuscripts show that they also accompanied crusading forces to Palestine. The steering oar is still employed, but the mast is stayed laterally by shrouds, kept taut by deadeyes and lanyards. The decorative prow has also now become a functional bowsprit, the sheets attached to It helping to hold the sail to the wind. Within half a century, warships would become much more seaworthy, and would include a built-in aftercastle. 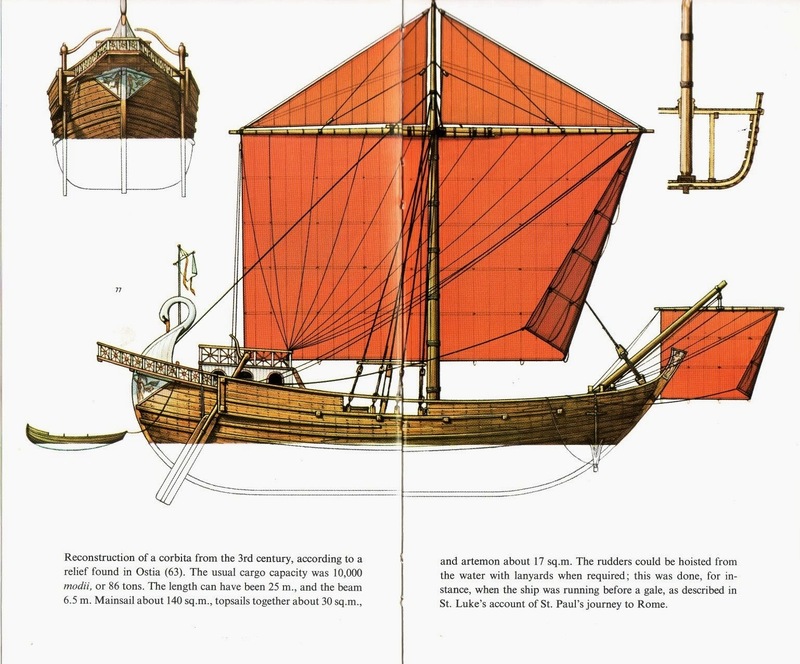 Mediterranean cargo ship – Ninth Century AD. Vessels of this type plied the waters of the Mediterranean around the ninth century AD. Although the basic hull was that of the old Roman cargo ship, its look above the freeboard was very different. The steering oars were still brought within an extension of the upper hull; however, the stern and prow were far simpler, and the bowsprint gone completely. 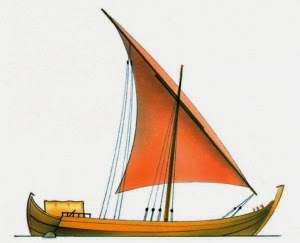 The ship’s mast, stayed by shrouds, had a forward tilt to accommodate the double-sparred yard of a lateen sail, a feature probably copied from Arab vessels. Lateen sails could be trimmed much closer to the wind. Roman 1st Century Merchant Ship. The Greeks had traded across the Mediterranean in the Bronze Age, but the scale of Greek involvement in long-distance trade appears to have dramatically declined from c.1200 bc, in what scholars refer to as the Dark Age of Greek history, reviving only in the eighth century bc, when Greek traders are found alongside Phoenicians, Syrians, Etruscans and others at places like Al-Mina on the coast of Syria and Pithekoussai (Ischia) in the Bay of Naples. The renewed growth of Greek trade in the Mediterranean was stimulated by the development of numerous small, independent urban communities, similar to those of the Levant. These city-states traded freely by sea with each other and with the rest of the Mediterranean, encouraged by the relative ease with which goods and commodities could be moved between the numerous small bays and inlets which made natural harbours. A great deal of the archaeological evidence of Greek and Roman trade is most obviously furnished by ceramic remains, such as painted vases and amphorae (storage jars), which indicate the presence of traders who were of Greek or Roman origin, or those who were in close contact with the Greeks and Romans. These ceramics do not necessarily represent the main items of trade. They may be containers for bulk commodities such as wine or fish sauce, or they may be goods of moderate value such as painted pottery, which accompanied luxury items, functioning partly as ballast. Some places developed a speciality in particular products, for example glass from Egypt, fine textiles from Kos, oil from Athens, fish from the Black Sea, grain from Sicily. Specialized markets emerged, whether because of their location on trading routes or near to sources of supply and demand, or because of favourable political conditions. Thus Corinth was from early times a focus for overland and seaborne trade. Hellenistic Rhodes profited from her position between the Levant and the Aegean, and from her close links with Egypt, becoming a major grain market. Delos, which had the status of a free port after 166 bc, was a very important centre for the slave trade. Alexandria flourished under Ptolemaic and Roman rule as one of the main links between the trading networks of the Indian Ocean, Asia and the Mediterranean. The movement of goods, commodities and slaves without exchange, whether through war, piracy, nonreciprocal gift-giving or tribute, was also an important aspect of ancient economic activity. Navies and pirates might occasionally interfere with the seaborne trade of the Mediterranean, but they rarely caused any long-term disruption. It was not in the interests of the inhabitants of the region to discourage merchants from carrying their cargoes from city to city. A substantial part of the Greek and Roman slave trade was supplied from prisoners of war, or the victims of piracy, and in the second and first centuries bc the Romans acquired large quantities of grain from their provinces of Sicily and Africa as tribute. Nevertheless, the economic world of the ancient Mediterranean can be characterized as one in which maritime trade was highly developed and, especially at the height of the Roman Empire, it was an integral part of Classical civilization. Most coastal cities built commercial harbours with quayside facilities, including warehouses and offices for merchants and magistrates. Within a large city there might also be specialized marketplaces, such as the fish market at Athens or the slave market in Alexandria. The Romans were great civil engineers whose creative energies were channelled into both impressive and practical building projects. They even developed a form of concrete which would set underwater and this led to the creation of commercial harbours on a grand scale at places such as Leptis Magna on the Libyan coast, Caesarea in Palestine and Ostia, the port of Rome, at the mouth of the river Tiber. The easy movement of bulk goods by sea both encouraged and was encouraged by the proliferation of large-scale urban centres and the needs of a standing army in excess of 250,000 men. The city of Rome probably had a population of over one million in the first to fourth centuries ad. Its immediate agricultural hinterland was not capable of feeding it, however, and to sustain its inhabitants seafaring merchants imported grain, wine and other staples from Spain, Africa, France, Sardinia and Sicily and other parts of the Mediterranean. Long-distance trade was mostly carried out on a small scale by professional traders who either received items directly from the producers, in return for money or other goods, or bought them from other merchants, and then passed them on to the consumers, again in return for payments in money or in kind. Much of this trade was speculative and traders might have to visit several places in the attempt to dispose of their cargoes. In literary sources the typical trader is a free person of moderate wealth who moves from one market to another, buying and selling a range of goods in varying quantities. He may also have his own ship, but many traders formed temporary partnerships with ship owners. Both the Greeks and the Romans had a strong social prejudice against traders, who were considered inferior in moral and social terms to landowners. The Romans attempted to legislate against a high level of involvement in maritime trade among their aristocracy, limiting the size of ships which senators could own. It seems that although such laws were aimed at maintaining the image of a ruling aristocracy which was above the petty affairs of merchants, in practice the wealthy landowners of the Roman Empire were heavily involved in maritime trade, operating through semi-independent middlemen. Roman shipping merchants formed associations for religious and social purposes and they were encouraged to pass their businesses on to their heirs by imperial authorities conscious of the need to maintain the flow of seaborne commerce. To cut a long story short I built five ships, got a cargo of wine, worth its weight in gold in those days, and sent them to Rome. Every single ship was wrecked; you would think it was a put-up job. That’s the truth, I’m not making it up. In one day Neptune swooped thirty millions. Was I downhearted? No, I assure you, I felt the loss as if it was nothing. I built some more, bigger and better, more successful, and everybody said I was an intrepid fellow. You know, a big ship has a lot of staying power. Once again I shipped wine, bacon, beans, Capuan perfume, and slaves … There’s no delay when the gods are on to something. In one trip I rounded off a good ten million. I promptly bought up all my patron’s estates. I built a house, I bought slaves and livestock; whatever I touched grew like a honeycomb. Trimalchio’s story is exaggerated for literary effect, but it vividly conveys the risk, excitement and potential for gain inherent in maritime trade for individual merchants. The scale of some aspects of maritime trade was larger in the heyday of the Roman Empire (31 bc–c.ad 400) than it had ever been before, as can be seen from the evidence of processing and distribution installations, discarded storage containers (amphorae) and wrecked merchant ships. Bulk cargoes of grain, wine, oil and other staples were taken in fleets of merchant ships between major collection and distribution points, for both state and private customers. The trends outlined above for maritime trade were, in general terms, repeated in other parts of the world. The gradual growth of powerful states and stable, sophisticated economic systems encouraged maritime (and, of course, terrestrial) trade. By the middle of the first millennium ad most areas of what we call the Old World were linked in extensive trade networks, many of them maritime. While only the shipwrights, sailors and maritime traders were totally dependent upon seafaring for their livelihoods, it is true to say that maritime networks promoted and helped to maintain highly diverse social structures in which individuals and groups were able to specialize in economic, religious, military and cultural tasks. It is important to emphasize the role of staples in the expansion of this trade. A great deal of it was bulk cargoes of food, raw materials such as metals and timber, cloth, aromatics and spices which were so thoroughly embedded in the urban cultures of many places in Europe, the Mediterranean, the Near and Middle East, South and East Asia, that they can be considered part of the fabric of civilization.